David Cronenberg has long been obsessed with the battle between the Flesh and the Spirit. His horror films (and some others) have explored a primal fear of flesh in revolt. "The Brood" was an early look at Cronenberg's peculiar fears. Filmed in 1979, "The Brood" involves a metaphysical psychiatrist treatment that causes the patient expunge their issues through physical mutation. Oliver Reed and Samantha Eggar star in this interesting, if not completely successful sci-fi/horror outing. Dr. Hal Raglan (Oliver Reed) is a psychiatrist who has created a therapy called 'psychoplasmics.' Thirty or so patients live in isolation at his country retreat/research facility: Somafield. Dr. Raglan is treating Nola (Samantha Eggar: The Collector), a woman in the verge of divorce. During therapy sessions, Dr. Raglan becomes the person who has scarred the patient. The patient can then act through their problems. Nola has much anger; her mother physically abused her while her father ignored what went on. Frank (Art Hindle) is Nola's husband. He goes to Somafield to pick up his daughter. As part of Nola's therapy, her daughter Candice (Cindy Hinds) is allowed to visit on weekends. Frank is not allowed to talk to his wife. Frank notices that Candice has been beaten. Frank begins to look deeper into just whatâ€™s going on at Somafield. As Nola's therapy intensified, people who have hurt her begin to die at the hands of a mallet-wielding midget. I'll tell no more. 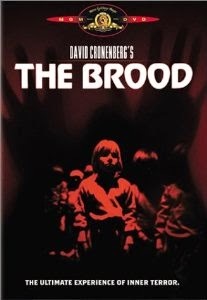 "The Brood" has some interesting parts, but the movie as a whole doesn't rank among Cronenberg's best. The therapy sessions are intense. Oliver Reed makes for a very menacing heavy. Art Hindle is too much of a lightweight to carry the film. Unfortunately, it is Hindle who gets most of the screen time. I also was disturbed by the scene in which Candice's teacher was murdered. Two of the murderous midgets bludgeon her to death with hammers in front of her students. I have a problem with the fact that very small children were expose to the filming of that scene. We're talking preschool kids watching a brutal beating. Enough of my editorial. The film is very slow. I was ready for the finale 20-minutes before it happened. Speaking of the finale, it is very gross. Effective, but very gross. Fair movie. Ok picture and sound. No real extras but priced to reflect the lack of extras. There are several artifacts. There are also some major delineation problems. Loss of detail in the shadows. The flesh tones are a bit pink. The mono soundtrack is flat. This was the first movie on which Howard Shore collaborated with director Cronenberg. His score isn't bad, but this mono track leaves much to be desired. There are no extras except for the original theatrical trailer. As I said before, the price reflects the lack of extras. Cronenberg fans will want this. It's worth the price of a rental.